OilObit.com News/Source: Daimler PR, Düsseldorf/Stuttgart – November 29, 2010: Daimler CEO Dr. Dieter Zetsche was presented with the German Sustainability Award 2010 by European Commissioner Günther H. Oettinger. The award’s conceptual sponsor is the German Sustainability Award Foundation in Düsseldorf. The award is presented to companies that combine business success with social responsibility and nature conservation, and that act sustainably to promote further growth. The focus is on consistent sustainability management and sustainability-related issues in brand management. The Mercedes-Benz Atego’s innovative hybrid drive marks the first time that Daimler is offering this very low emission technology in Europe ex works, thus making it immediately available to customers as a highly sustainable form of freight transport. The vehicle is based on the Euro 5-compliant Atego 1222 L, which already meets the environmentally friendly EEV standard for especially low particulate emissions and can therefore be driven on German highways toll-free. Its compact and lightweight four-cylinder diesel engine with 4.8 liters of displacement generates 160 kW (218 hp). The engine is complemented by a water-cooled electric motor with a maximum output of 44 kW. The motor is supplied with electricity by powerful, high-energy lithium-ion batteries. The electric motor is mounted behind the combustion engine and clutch, but in front of the transmission. With this configuration, both drive units can power the truck individually or in combination. Thanks to this parallel hybrid drive architecture, it is possible to start solely on electric power, recover braking energy, obtain a boost from the electric motor, and optimize the diesel engine’s characteristic curve. The drive power of the diesel engine is engaged via the clutch between the diesel engine and the electric motor. Until this point, the combustion engine serves solely to power the ancillary components. This setup not only substantially reduces fuel consumption and emissions by up to 15 percent, it also produces less noise. The engine’s automatic start-stop function reduces fuel consumption, emissions, and noise to zero when the vehicle is waiting at traffic lights. The first batch of 50 Atego BlueTec Hybrids will be delivered to German customers from the distribution sector in early 2011 in order to demonstrate this important future-oriented technology’s suitability for everyday use. The German Ministry of Transport, Building and Urban Development is helping to fund the vehicles as part of its Electric Mobility Support Program. 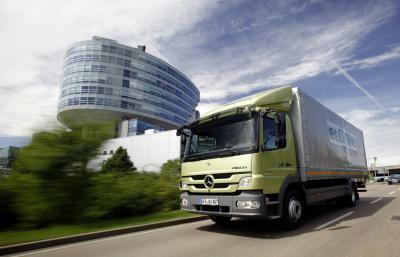 The Mercedes-Benz Atego BlueTec Hybrid is part of Daimler’s Shaping Future Transportation initiative. As such, it helps the Group achieve its medium- and long-term environmental goals. At the same time, this practical contribution to sustainable freight transport also benefits customers and the European freight-forwarding sector. Solar Panel System Investment for Retirement Low-Risk High Returns?